I have a cool piece of technology to share with you today! I'm pretty excited about it because I've wanted to try it out for a long time. It's the Osmo iPad Gaming System and it's available at Best Buy. We received the Genius Kit to test out and review, and it comes with five games. Osmo has lots of great ways to learn, but it focuses heavily on S.T.E.A.M. learning. The games are designed for children ages 6 and up but my 4-year-old was playing it with us just fine. I think if you're playing with your younger child they can do the easy levels. 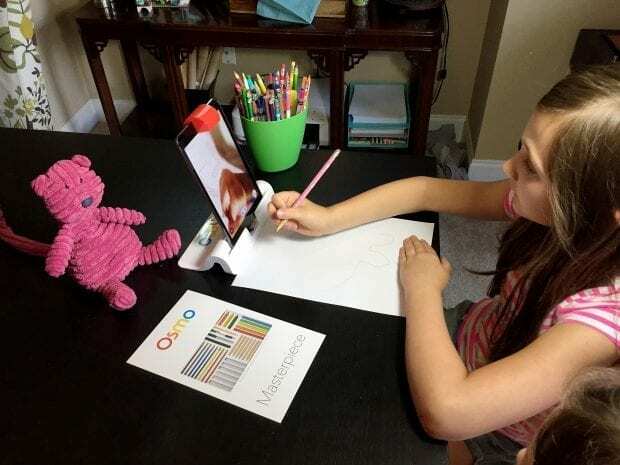 In order to play the Osmo games, you need the Osmo base which is an iPad stand and a mirror that goes over the camera so that the device can see what is happening on the table in front of it. Words – Be the first to guess and spell out the on­screen hidden word by tossing down real­life letters faster than your friends. A related picture gives the clue. Words comes with letter tiles to build words. You can start with Junior words and finish a word by guessing the missing letters from the word. Make is a little harder and guess all the letters in the word. The game shows you a picture, and you guess the word. It uses beautiful photos in the game too. Numbers – With a counting, addition, concatenation and multiplication mode, there is a challenge for everybody. As kids get more confident in one mode, they can move on the the next one, allowing them to learn at their own pace. This game is a fun one. You have to release the water bubbles by using the counting or number tiles. As the bubbles pop, fish and other aquarium surprises fall into the water. You move to the next level when you've freed the golden key. As the game progresses, you start using addition and even multiplication. 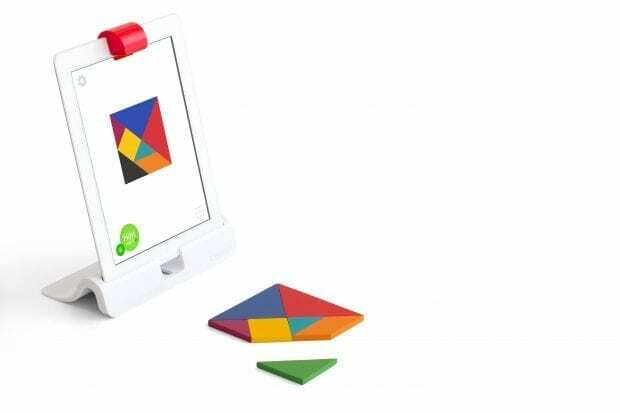 Tangram – Arrange wooden puzzle pieces into matching on­screen shapes. Play with your child or challenge yourself to more advanced levels with Osmo acting as your mentor by lighting up with each victory. With the colorful Tangrams, build the picture you see on the screen. For harder levels, they take away the colors, so you have to use trial and error to make the shape. Masterpiece – Supercharge your drawing skills with Masterpiece. Pick any image from the camera, curated gallery or integrated web search and Masterpiece will transform it into easy­to­follow lines and help you draw it to perfection. You can then share a magical time­lapse video of your creation with your friends and family. This game is an awesome way to learn to draw new things. You can use the preloaded coloring sheets to draw on the paper. You'll learn to watch the iPad screen while you trace the lines. It takes some getting used to but it is so cool seeing the cool things you can draw. You can also take a picture of anything and turn it into a traceable image. We took a picture of a toy and then JaMonkey drew it on the paper. You can also do self-portraits! Newton – Use your creativity with inventive objects such as a hand­drawn basket, grandma's glasses, dad's keys or anything around you to guide falling on­screen balls into targeted zones. This is my daughter's favorite game. Using a white board and some tangrams, she makes obstacles to make the falling balls go into the direction she wants in order to shoot them into the targets and move on to the next level. So far our favorites are Numbers and Newton, but I showed my daughter how to use Masterpiece, and now she is excited about drawing lots of new things. This kid loves to draw. We plan on picking up the Coding game when it becomes available at Best Buy. She has been playing coding games at school and really likes them, so I'm excited for her to try this one. We've had hours of fun with this system; I highly recommend it. 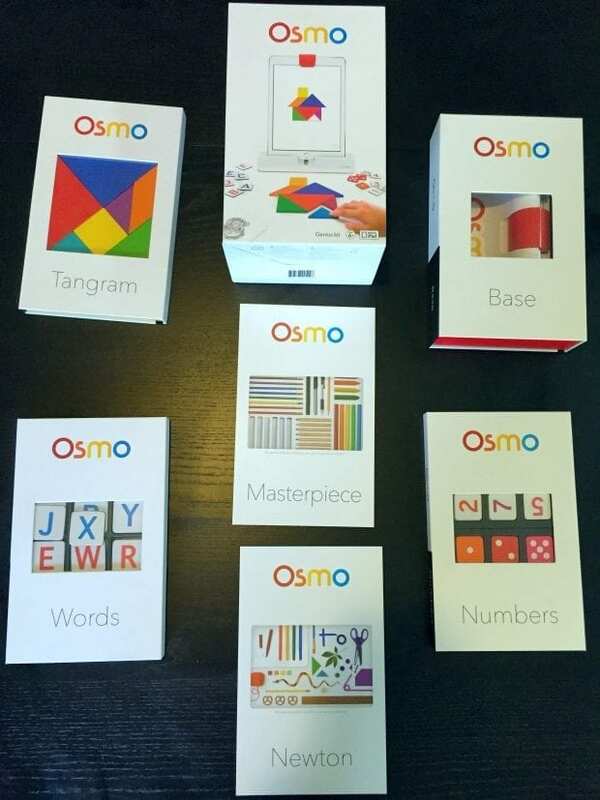 You can pick up Osmo at Best Buy. You can get the Genius kit that has all the games or individual games.